With the elongated head of a giraffe, complete with little horns and lolling tongue, the stripey derriere of a zebra, and a chocolate brownish middle bit, it’s no surprise that the Okapi, along with creatures like the Loch Ness Monster and the Yeti, was dismissed as a cryptid by European scientists for the longest time. Being naturally elusive creatures with a distribution limited to the Ituri Rainforest in Northeastern Congo, the Okapi was actually not even a speck on the European radar until brave explorers started taking on the dark continent and sending home reports about the strange creatures they encountered, of course including these. Press reports covering one, Henry Morton Stanley’s journeys first brought the mythical creature to Western attention sometime during 1887, but it wasn’t until Harry Johnston, an adventurer and colonial administrator, got involved that the Okapi became a real thing. He started by sending skins and skulls to scientists, and finally got some funding to further his research. His lucky break came with the discovery of a carcass. Yes, a carcass, that he unceremoniously shipped off to England to be dissected and then probably displayed in 1901. 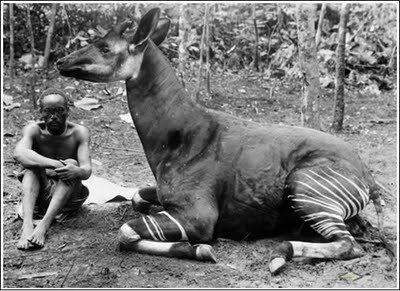 Of course it took the capture of a live specimen to banish the last bit of skepticism and the Okapia johnstonia, commonly known as the Okapi was declared a real, live, tangible animal soon after. Although I have seen quite a few Zoo Borns posts on Okapis, the most interesting reference I’ve come across was in the first chapter Barbara Kingsolver’s heart rending book, Poisonwood Bible. She is inhumanly alone. And then, all at once, she isn’t. A beautiful animal stands on the other side of the water. They look up from their lives, woman and animal, amazed to find themselves in the same place. He freezes, inspecting her with his black-tipped ears. His back is purplish-brown in the dim light, sloping downward from the gentle hump of his shoulders. The forest’s shadows fall into lines across his white-striped flanks. His stiff forelegs splay out to the sides like stilts, for he’s been caught in the act of reaching down for water. Without taking his eyes from her, he twitches a little at the knee, then the shoulder, where a fly devils him. Finally he surrenders his surprise, looks away and drinks. She can feel the touch of his long, curled tongue on the water’s skin, as if he were lapping from her hand. His head bobs gently, nodding small, velvet horns lit white from behind like new leaves. 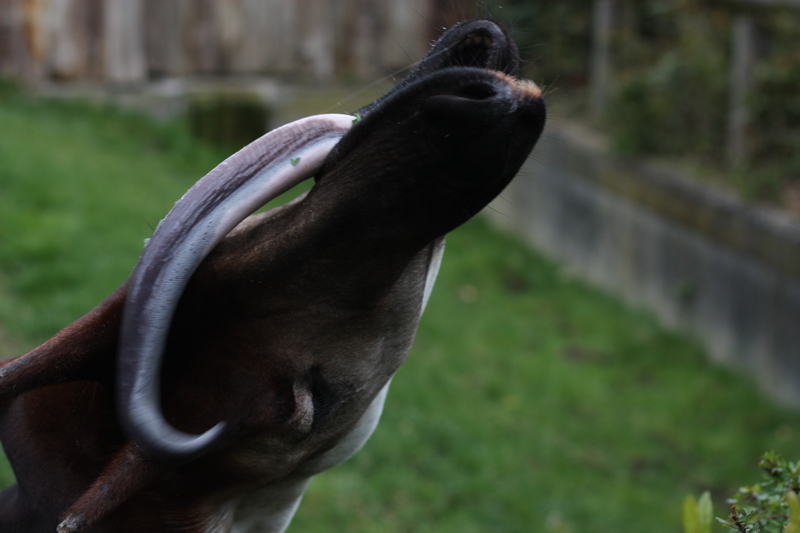 …That one time and no other the okapi came to the stream, and I was the only one to see it.